● A woman travels with her husband to rural China. In the middle of the night, she awakens with major discomfort indicating a vaginal infection. A remedy was no where to be found for days. (Clearly, she didn't carry Monistat or the equivalent in her first-aid kit.) Imagine how this messed up this couple's travels. ● A family goes mountain biking in Idaho and one of the kids falls, knocking out a tooth. If the tooth is properly preserved in the correct solution -- found with the product Save-A-Tooth -- it could be reimplanted. The family only had water bottles and a standard first-aid kit. Result: the tooth dies! ● A man is hiking in Italy's Dolomite mountains when he falls on a sharp rock, lacerating his leg. Doesn't sound like such a big deal, right? Just a few band-aids should be fine. This man was taking anti-clotting medications. He didn't carry a special gauze pad that enhances blood clotting. The result: unexpected blood loss. ● A woman is camping in a national forest in northern Florida. Sitting near the camp fire, she gets some debris in her eye. She tries sprinkling some water in her eye, to no avail. It becomes so irritating over a period of hours that she's forced to drive to the emergency room. If only she carried a saline eye wash and some lubricating eye drops. I was just interviewed by the online magazine, The Cultureist, on this product that I just developed. Find out how it can save your next trip, whether you're traveling domestically or to a far-flung locale. You can buy Doc-in-a-Bag™ here. And also from Amazon. sounds like a great way to share your knowledge, J, and to help people organize for travel. 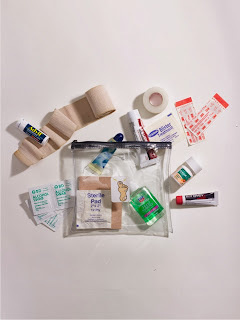 Interesting post and scenarios about first aid kits while travelling. 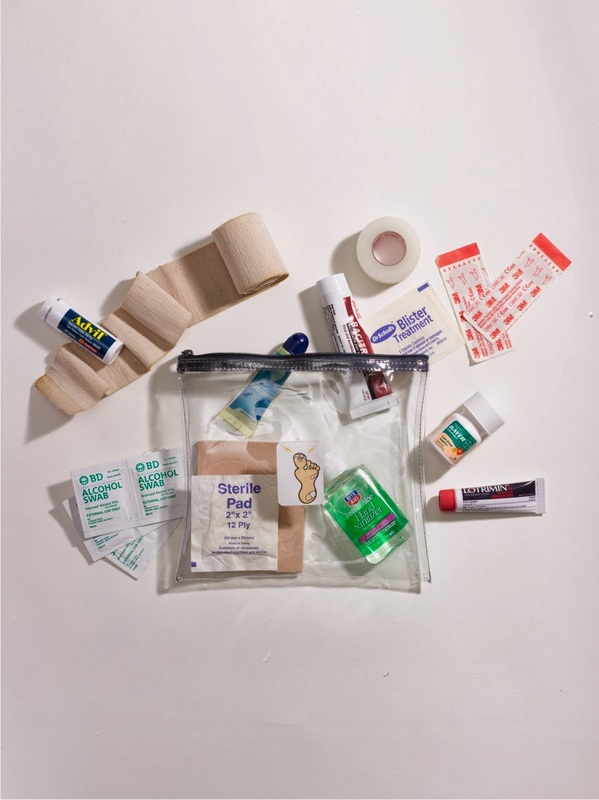 Do you think many parents pack first aid kits before travelling? Thanks, Kerry. Yes, I'm all about being organized, particularly regarding travel health issues. Hi Pediatrician, Thanks for commenting. No, I don't believe most parents pack much in the way of a complete first-aid kit. If anything, it's fairly basic: Tylenol, bandages, that sort of thing. This is a great all-in-one idea for families. I've been been packing all of this and much more years since my family always seems to have some crazy medical event. Such a good idea. I think I'm pretty well prepared for general not feeling well kinds of things, but an actual injury? I'd be at a loss. Sounds like a much better option than the usual bare bones first aid kit. Love the idea - the concept - and the name. How clever. And something we should all be traveling with. Thank you for alerting me to this unusual first aid kit, which deserves to be in the suitcase of all travelers abroad. Hi Alexandra, Thanks for your enthusiastic comment. Glad you liked it. Hi Sheryl, Thanks so much. Everyone who has purchased it has found it very handy. Hi Melanie, Yes, it's amazing that so many people overpack in terms of clothes and shoes. Yes, when it comes to first-aid supplies, it's just all about band-aids and Aleve. Hi Roxanne, You're in the majority, for sure. Injuries or potentially serious illnesses is not what anyone thinks will happen on a trip or are they prepared for it should it happen. Hi Brette, You sound like the savvy traveler. I wish more people were like you. Fascinating and helpful post about something I've been too naive to think about. My husband and I have been lucky -- so far. It's time to get more prepared. What a terrific idea. I love that was put together by an avid and experienced traveler...takes the guesswork out of it for the not-so-experienced traveler like me, but who likes to be prepared. Hi ruth, I often come prepared on my trips just in case the people I'm traveling with are not. Hi merr, So glad you like my first-aid kit organizer. Yes, I'm definitely all about preparedness. What a great idea! I'm usually pretty prepared (but not THIS prepared), and to have all of this in one handy pack would be super. Hi Jane Louise, I'm all about being more prepared than you need to be. Wow, what a great list to prepare you for any disaster while traveling! The tip about packing save-a-tooth is especially great. It could be so easy to have a freak accident like that and I would never think of packing that. I usually on think of the basics like my favorite product, tegaderm invisible wound bandages. I'm so glad you thought of everything I would have forgot! Hi Ann, Well, you sound pretty well prepared also. If travelers packed everything I recommend for this organizer, they'd be way more prepared than even the typical savvy traveler.